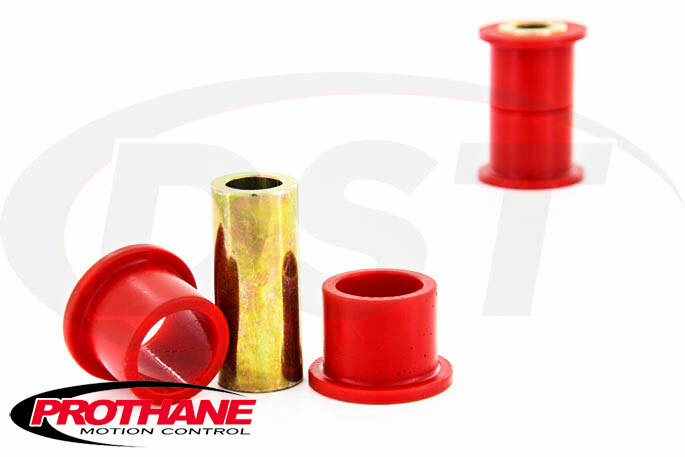 Prothane's polyurethane steering rack bushings are a much more durable replacement for the original rubber bushings and will maintain the position of the rack and pinion. Prothane Steering Rack (Rack and Pinion) Bushings will replace rubber bushings and tighten up the feeling of the steering wheel and even reduce steering wander. Find Prothane's steering rack bushings for your vehicle below. The original bushings that hold the steering rack in place can wear out, which can cause a clunking or popping noise. The rubber of the original bushings absorb vibrations from the road but as the rubber bends and flexes over time it begins to hollow out and lose its shape. The more worn those bushings become the more noise you will notice, and the greater the chance you will experience loose steering and possibly steering wander. Prothane's polyurethane steering rack bushings are a much more durable replacement for the original rubber bushings and will maintain the position of the rack and pinion. Polyurethane holds it's shape longer than rubber and also withstands engine fluids, road salt, and other elements that can begin breaking rubber down. If you're looking for a long-lasting replacement that will tighten up your steering wheel, Prothane's steering rack bushings are a great choice. These bushings are Made in the USA and covered by a Lifetime Warranty.